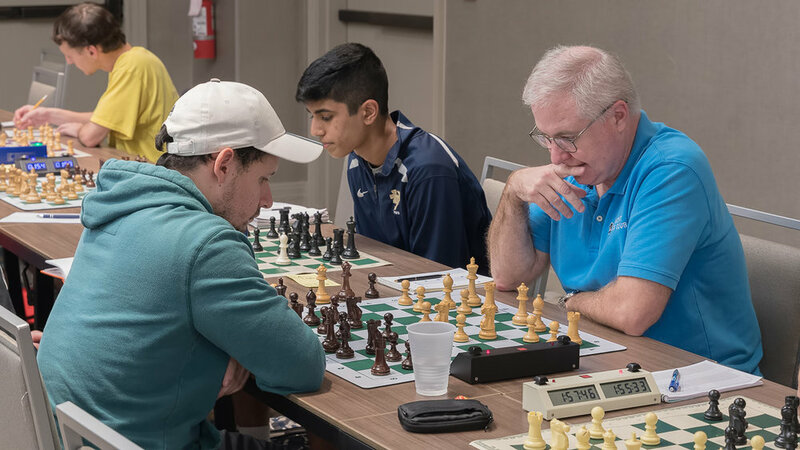 Board One, Round 2, with UCF's Nick Moore (2144) (L) vs John Ludwig (2463) (R) in the CFCC Class Championship last weekend in south Orlando. 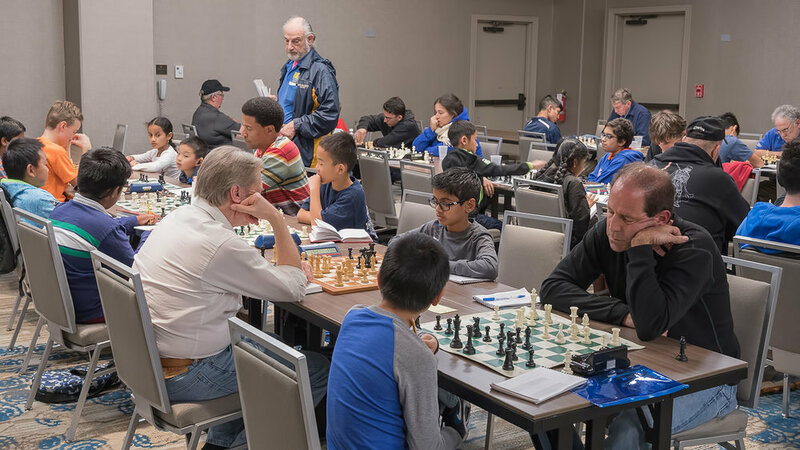 The Central Florida Chess Club (CFCC) Class Championships were held at the DoubleTree by Hilton Orlando hotel at SeaWorld, which was a great venue because the hotel was spacious, and the playing conditions were great. 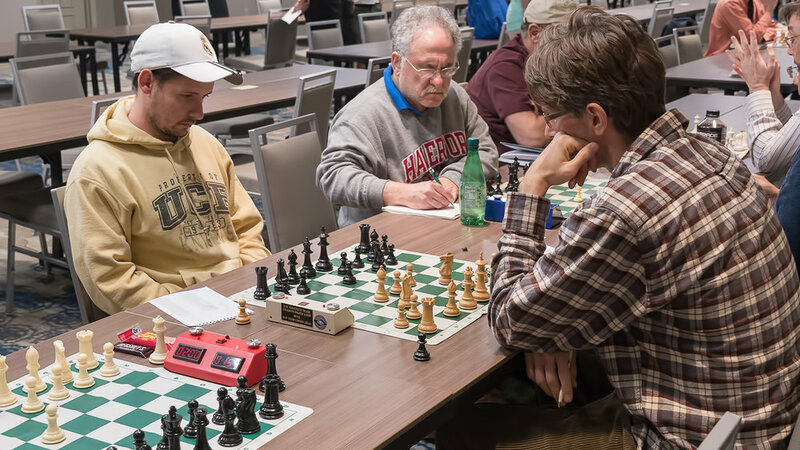 Going into the tournament, John Ludwig was the top seed, followed by Corey Acor, just sixty-two points behind. They were the clear favorites since the third seed was 164 points lower rated than Acor. There were only four entrants in the three-day schedule in the Open, including yours truly. On board one on Friday night, I was Black against Steven Lenhert, who played a trendy variation in the Catalan, which has been played before by GMs Boris Gelfand, Wesley So, and Vladimir Kramnik. I knew this variation, but then I played a “natural” (according to GM Max Illingworth) move which was a mistake, giving Lenhert a big advantage. He did not capitalize on it in the best way, but I later blundered handing him a winning position with an outside passed pawn. I fought hard to hold it, he did not play as accurately as he could have, and we reached a position where he was better, but it should be a draw with correct play. However, I had a lot less time than my opponent, and that eventually told when on move sixty-three with less than twenty seconds left, I made the decisive error, allowing Lenhert to win. 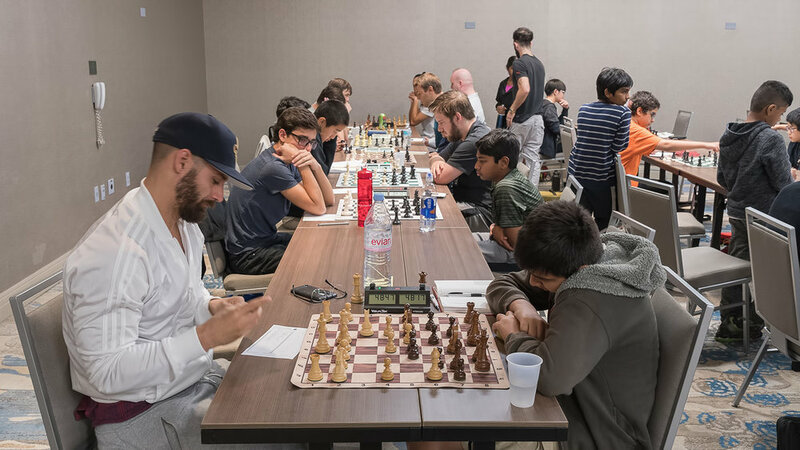 On Saturday morning in the two-day schedule, Acor was White against Kai Tabor; it was a Closed Sicilian, and Tabor equalized comfortably. The game did not veer too far from the equilibrium until the twenty-third move, when Black perhaps became too impatient, trading White’s impressive Knight, but allowing him to create a dangerous passed pawn, which in the end, cost Black. Meanwhile, on board one, Ludwig got off to a perfect start, defeating Yandri Morales. In round two, once the two-day and three-day schedules had merged, Acor beat Blake Baumgartner. 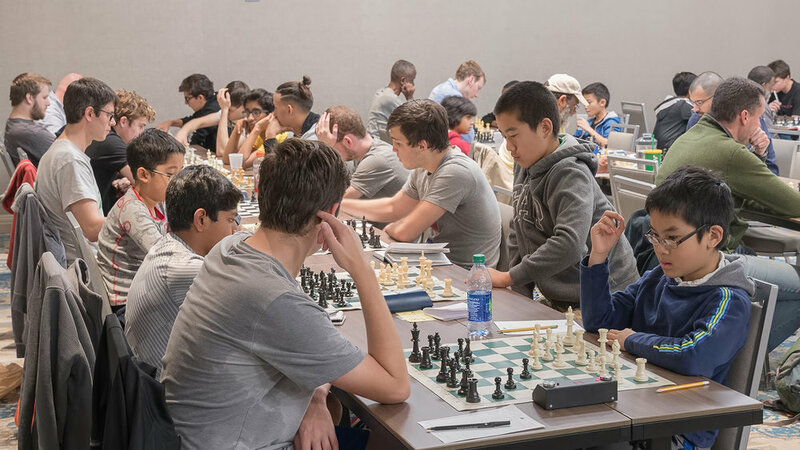 However, Nickolas Moore got a great result, holding Ludwig to a draw as Black. Midway through the tournament, the top two seeds met. Ludwig was Black and played the Scandinavian Defense; a quick draw ensued, which probably suited Acor given that it ensured he kept his tournament lead. 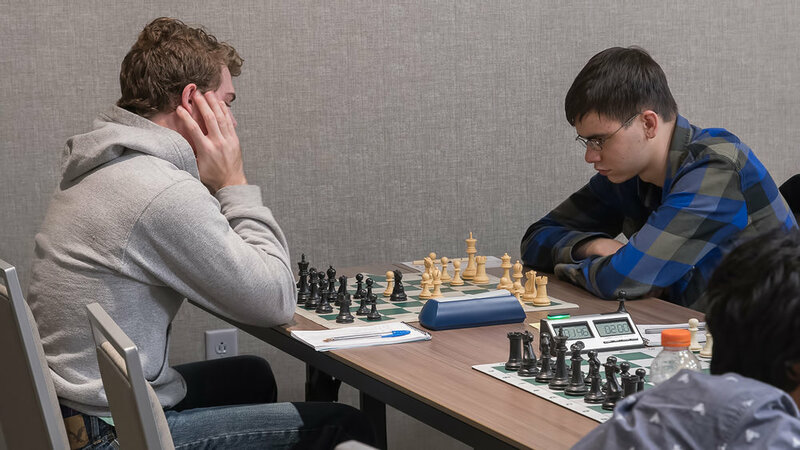 In the penultimate round, Ludwig upped the pace by defeating Lenhert as Black, and in the meantime, Acor was Black against Joshua Harrison. It was an Italian, but one where Black equalized quickly by snagging the Bishop pair. The position remained balanced for twenty-eight moves, but on the twenty-ninth, White allowed Acor to suddenly and drastically improve his pieces, which gave him a significant advantage. Just three moves later, Black was already winning and efficiently converted. That just goes to show how quickly things can go south in chess . . . In the last round, Ludwig beat Baumgartner as White in a Caro-Kann, whilst Juan Marquez Pereira was White against Acor on board one. It was a Vienna Game and a sharp position was reached in a hurry. Just sixteen moves in, White was already winning, but missed his chance and blew the lion’s share of his advantage. Later on, Black was actually slightly better despite being a pawn down due to his more active pieces and Bishop pair. However, the players transposed into an equal ending where White was a pawn up, but it looked to be only temporary as Black could get it back . . . but he did not! So suddenly Pereira was a pawn up in a winning endgame when just four moves ago it was drawn. He had a chance to create a protected passed pawn, which would have won, but passed up this gilt-edged opportunity. Further mistakes were made by both sides (time may have been a factor) but this roller coaster of a game finished with the point shared. Moore and Marquez Pereira tied for third on 3.5/5. Marquez Pereira also gained the most rating points in the tournament, going from 2120 to 2146. Both Moore and Marquez Pereira remained unbeaten throughout the tournament, as did Ludwig and Acor, who tied for first on 4/5. Congratulations to all of these players!